THE ANGELIC HIERARCHY OF OUR GUARDIAN ANGELS. Here is an article I have written for you about the Angel Hierarchy, which will help to explain how our guardian angels work with us and help us throughout our lives to comfort and guide us. enabling our finite minds to arrive at a wider understanding of divinity, infinity and the scheme of the universe. The main esoteric teachings about angels, comes from zoroastrian and hebraic sources. All our discarnate guides seek a more personal relationship with us. They are trying to teach us about the nature of light and energy, and to help us understand the dimentions of levity and that of gravity. Guides are part of the human stream of conciousness, but angels are not. Guides have been incarnate, angels will never be incarnate. Guides and humans will never be angels. Our angels belong to a collective body of mutual support for us. They emenate from God and are divided into groups. Each group of angels have a specific task or area of interest. THE DIVINE PRINCIPLES AND ARCHETYPES OF HIGHER QUALITIES. The multiple facets of the divine mind of God, governs the universe by the different groups of our guardian angels. Spititual philosophies speak of divine principles. People speak of `archetypes of the higher qualities` in a common attempt to describe the ideals, impulses and aspirations experienced by us. A divine archetype of higher quality exists as an abstract energy. Peace, Beauty, Wholeness, Justice, Love, Order, Health, Creation, Harmony and Balance are within this energy. This energy is the angelic essence. When you want to fulfill and improve your life this is how you connect to the angelic essence. You will feel personally much more supported if you name the angels you wish to help you and consciously ask for their help and support. The word angel means `messenger` and when you send messages to them, they help this energy to work both ways. Elementals and spirits are part of the same energy as angels. There is a special life-force that comes from God and Archangels that helps plants and minerals to grow. The angels that are closest to the divine energy are referred to as heavenly councilors. Are the most highly evolved angels who work to keep Balance, Alignment and Movement by working with God and the heavenly bodies. Cherubim are the true Light workers and they work as guardians of all the Light and Colour energy in the universe. They help to direct light from the Sun, the Moon and the Stars so that it can be received in those places where it is most needed. They help to maintain the Bridge of Light between the planes of the higher and lower vibrations. Our earth is the Lower Vibration of energy, and our bodies are the protective clothing we need in order to function on this earth plane. Our souls and spirits have Higher Vibrational rates, Divine Light is too intense for our bodies to sustain. It is this bridge of energy and light that helps our souls to safely experience Extra-Sensory Perception that is the result of mystical experiences within our subconsious mind. Our personal guides and angels can cross this bridge of energy and light in order to get closer to us and help us in our every day life. Meditation practice and channeling, help us to strengthen the energy of our spiritual souls so that we can sense the higher energy in order to have clearer and safer contact with our guardians and the angels. Virtues are the Listeners who respond to prayers, and our requests for healing, by directing energy to specific areas via the chakras, to individuals who are praying for advice. Powers are the inspirer`s of our human conciousness, they oversee the rhythms of Birth, Death and Rebirth. Spiritual teachings refer to the `Achashic Records` Jung wrote extensively about the `Collective Unconciousness` and Rupert Sheldrake speaks of `Morphic Resonance`. These are the different ways of expressing the belief that all thoughts and actions create waves which affects other members of the human race, as well as being recorded in our collective memory bank. Reincarnationists believe that there are Personal as well as Collective Akashic Records, the personal records of our soul`s Evolutionary Journey. The Collective Records hold the imprint of all Human Experience and Learning. The powers are the keepers of the Achashic Records and the guardians of the Collective Unconcious also the instigaters of Morphic Resonance. You can look upon this as the Ultimate Computer for mankind if you wish! 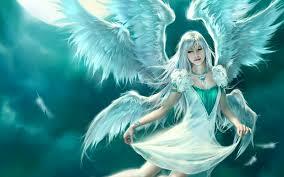 These angels oversee all aspects of Human Behaviour and help us to work with the Higher Divine Power. The most well known are MICHAEL, GABRIEL, URIEL and RAPHAEL. Archangels can be invoked to bring Blessings, Safety and Protection into our daily lives and they are able to assist us in gaining greater clarity of our purpose in life. Those who come closest to our earthly vibrations and bring us Joy, Laughter, Harmony, Peace, Love, Synchronicity and many other feelings are our guardian angels. I hope that this has helped you to further understand more about our wonderful guardian angels, who really are working hard to help us work for the better of mankind, to protect our childrens future, our own personal lives and for the greater benefit of our planet. Meditation is easy and enjoyable to learn, it just takes dedication and practice! just like any other art. My advice to you is to visit your local library, as you will find many books that help you to learn how meditation helps you in your daily life. It`s very relaxing and helps to strengthen your inner light. It brings you peace in this hectic modern day living of ours and it also helps to strengthen your psychic senses. I hope you have enjoyed my article and I wish you happy meditation, peace for your soul and strength and happiness in your endeavors to become proficient in the art of meditation.